It’s officially the month of GREEN. As a dietitian, when I think of green foods, I typically think nutritious – broccoli, spinach, avocado. Today I shared some unique AND nutritious ones to celebrate the holiday! Miracle Noodle is something I recently discovered at Whole Foods and now recommend to my clients as a diet tweak for weight management. The reason they are called “miracle” is because they are virtually calorie free. They are made with flour derived from the root of the Konjac plant, which is composed of soluble fiber. We don’t digest soluble fiber although it is good for many reasons including elimination and keeping us regular. It’s a good pasta substitute if you want to prepare a lightened up dish. They’re mild in taste, which makes them a perfect vehicle for adding flavor. I shared the green spinach noodles for St. Patrick’s Day but I also brought their plain variety, which you can add pesto and green herbs to to spice it up for St. Paddy’s! These are a total hit whenever I share them on air! They have that crispy crunch and savory taste that we crave in a chip, which makes them a great alternative, but they are naturally low in calories – about 25 calories per serving – and loaded with vitamins and minerals like vitamin C and vitamin K. I like gimMe because they are organic and have a variety of flavors including sea salt, teriyaki and wasabi (if you like some kick!). For those of us who don’t like eating our veggies, GREEN JUICE may be an easier alternative. If you have followed my blog for a while, you know I love my green juice to fill in fruit and veggie gaps. I shared 1915 Organic’s Romaine Juice. They list all the ingredients on the front of the bottle. This flavor has lots of veggies and some fruit (apple) to sweeten it – just how I like my green juices. Each of their juices contains six or less simple and organic ingredients – no added sugars or artificial sweeteners. A healthier cheers to St. Patrick’s Day! Matcha has become very trendy and with good reason. It is a fine green powder made from green tea leaves so it’s a potent source of antioxidants and also has a little bit of caffeine. 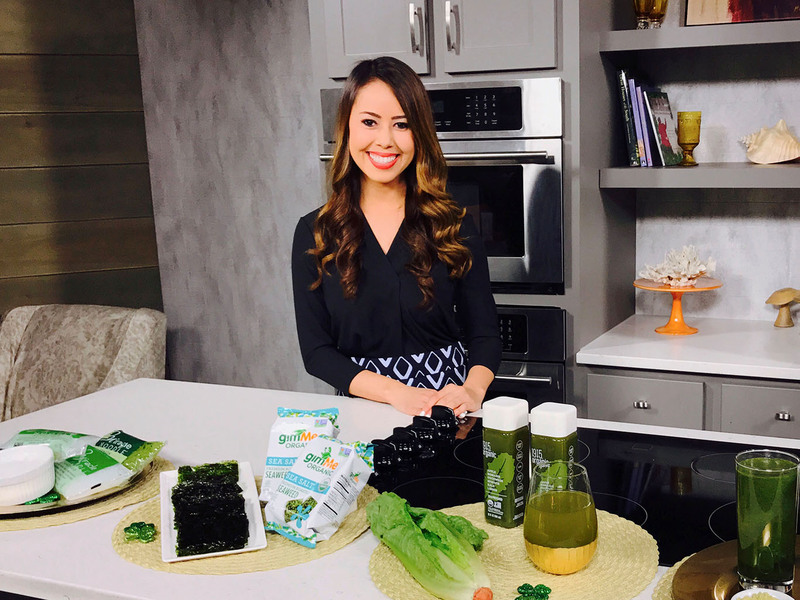 I shared Vibrant Health’s Pro Matcha, which is a mix of matcha powder and plant-based protein. I’ll add it to fruit and vegetable smoothies for a little energy boost and the protein can help keep you satiated. The protein helps balance out the carbohydrates from the fruit and veg. They use DoMatcha which they source from Japan where matcha originated. They process it to best preserve the flavor, color and the nutrients.